The North Wind just keeps on blowing this winter here in upstate New York, but rather than feeling housebound here at the Crispy Casa (and watching too many icy sports in the Sochi Winter Olympics) we've warmed up with books, films, music and foods focused on more sultry climes. The subcontinent of India has beckoned with the wonderful travel memoir by Tahir Shah "The Sorcerer's Apprentice" about his days learning the tricks of magic and illusion in Calcutta. 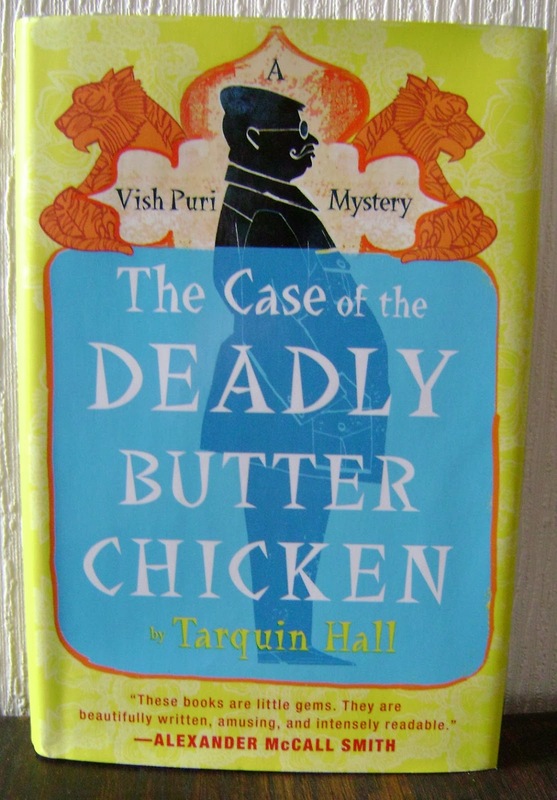 I've also devoured two of the four witty mysteries by Tarquin Hall featuring chubby Delhi private investigator Vish Puri and his motley gang of operatives. I buy these packaged chickpea (or gram) flour disks and then puff them up individually in the microwave for about a minute and a half, rather than frying them in oil, as the package instructs. They come in a variety of flavors and brands, but be sure to read the ingredient labels to make sure no wheat flour is added. I adjusted a great recipe I found in beautifully illustrated coffee table cookbook. 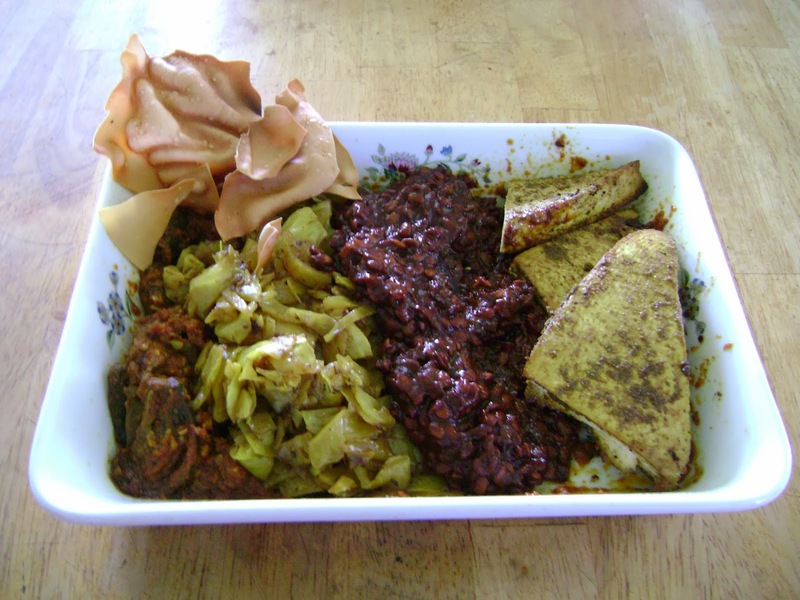 "The Food of India" (Bay Books, 2002) which called for fried wedges of those cute little round Indian eggplants simmered in a tomato sauce redolent with ginger, garlic, fennel, and coriander. I sauteed a handful of curry leaves in oil for a few minutes before adding them to the rice cooker. Another riff off a recipe from "The Food of India", very similar to this recipe link here. Basically, you saute chopped cabbage with your whole spice cabinet. I used the recipe from Moskowitz's epic "Veganomicon", linked here. The recipe recommends that the regular brown lentils not be used as they might get too mushy, so I used horsegram, which is a kind of legume popular in India that is lentil-y but remains very firm after cooking. My guests liked this recipe a lot, remarking that it was sort of like Indian Baked Beans. Mango Pickle was store-bought and extremely salty. Just need a little dab on the plate. Apple-Raisin Chutney was homemade from my recipe here. Veganomicon's recipe used here. Very easy to make with the added bonus, that unlike with a meat marinade, one can pour off the marinade from the tofu before baking to reuse as a base for another sauce or salad dressing. I wish I had remembered to take a picture of our beautiful feast as it lay unmolested on our dining table, but alas, I was in full entertainment mode, and only remembered to snap a photo of our leftovers. Just imagine some brightly colored table linens, bhangra music in the background and the smell of exotic spices wafting over us. To cap off our "trip to India", we all snuggled into the couch to watch a DVD of "Today's Special", a charming foodie flick about an impatient young first generation Indian man who learns how to cook great food, not from being a sous chef in a fancy Manhattan restaurant but from learning how to passionately appreciate life when he helps his ailing father reinvigorate their Indian restaurant in Queens. 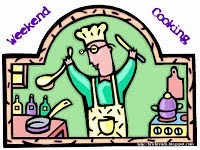 I am linking this post up with Weekend Cooking over at Beth Fish Reads, where each Sunday great cooks share their foodie musings and recipes. I'm passing this post on to my sister-in-law, you've got some things here. What a feast... and a perfect diversion from this harsh winter! I might give the tamarind lentils a try. What a lovely evening to fend off this cold air. You'll have to pick another warm destination to celebrate, I'm afraid, next week since the cold is supposed to be coming back. Ugh. Thanks for all the kind comments, everyone. Yes, Janel, I need a new warm destination. Was reading a book about sailing a wooden boat around the Caribbean, but the author says that it gets tiresome after awhile! Maybe I'll head to the Mediterranean coast for a good read, followed by a good feast. What a gathering and what a great feast to accommodate everyone. Yum. And I thought that movie was fun and light. What a wonderful meal! Indian food has so many options for vegan dining. "Basically, you saute chopped cabbage with your whole spice cabinet" is the funniest description of a recipe.